This 14kt white gold setting features 12 princess cut diamonds totaling 1/4 carats that have been delicately placed in the side of this ring. 10 round diamonds are channel set into this 14k white gold band, combining with the center diamond of your choice to make a spectacular engagement ring. 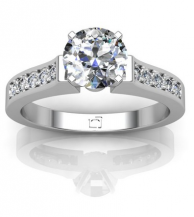 Your center stone can be any shape diamond, and total weight of the channel set diamonds is 1/8 carats.